The only people whose names can be pronounced with no threat, who can reveal their real names to others without fear, are either so utterly powerless that they have nothing to risk - like small children or my brother - or so strong that nobody would date try to harm them. You're too - too big, too strong, for this place. Not" - he raises a hand as he sees me about to speak - "not your body, although that's bigger and stronger than I think you know. No, it's you, it's Theseus. Without knowing it, they see that you're greater than any of them, and they're frightened and jealous. So they attack you. It's like wolves - you've seen how the leader has to continually fight to maintain his position?" . "It isn't true what they say about my brother - that he ate those children. He never did; he didn't even meant to hurt them. He wept as he held out their broken bodies, his soft brown eyes pleading with me to fix them, the way I always fixed his dolls and toys. Tonight is the new moon and I dance." 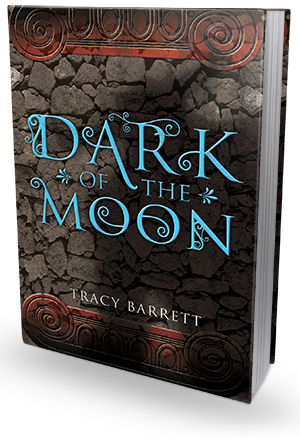 With these words opens Dark of The Moon by Tracy Barrett, a wonderfully realistic and emotionally riveting retelling of the Minotaur myth. Those with inquiring minds, interested in discovering what actual real-life events could have inspired the gruesome myth, will delight in reading it. Romance is not the focus of this book, despite the fact that in the original story it's love and passion that fueled the actions of Ariadne when she betrayed her family and helped Theseus kill the beastly Minotaur. In Dark of The Moon, Minotaur is Ariadne's brother, Asterion, and she loves him dearly. Ariadne is "She Who Will Be Goddess", a priestess who is seen as someone more than human, someone powerful and capable of wielding magic, even though in truth she's just an average girl who happened to be born into priesthood and destined to become the vessel for the Goddess. She's lonely, feared and isolated by the society, friendless and really quite unhappy. She's loving and caring, she knows what's expected of her but she's also intelligent enough to see the changes coming to her word. Theseus himself is brave and oozing confidence, but he's not this embellished, unbeatable hero in shining armor. Him being sent to Crete has little to do with a noble desire to slay the evil monster and stop the bloody sacrifices. In fact, all he really wanted was to meet his real father. Little did he know, his father did not care about him at all and just saw his arrival as opportunity to help himself. Barrett's Minotaur is a truly tragic character, and one that we grow to pity as we learn more about him and his condition. He's not some powerful supernatural being, definitely not a huge half-human, half-bull creature. He's really just a mentally disabled, physically disfigured young man, who can't control his actions and hurts people without intending to. In modern times, a person like that would be diagnosed with mental illness and treated in some sort of medical facility, back then - he was feared, hated and isolated. He did not inspire fear in me. To be honest, my heart ached for him. Told in alternating points of view of Ariadne (in past tense) and Theseus (in present tense), Dark Of The Moon is a beautifully imagined, well written tale of bravery and sacrifice, duty and fate, family bonds and friendship. The world building is really meticulous, rich and amazing, the characters - realistically drawn and authentic in every aspect. I loved what Barrett did here - how she took a vague, highly improbable mythical tale and turned it into something that could really be the true story of Ariadne and Theseus. 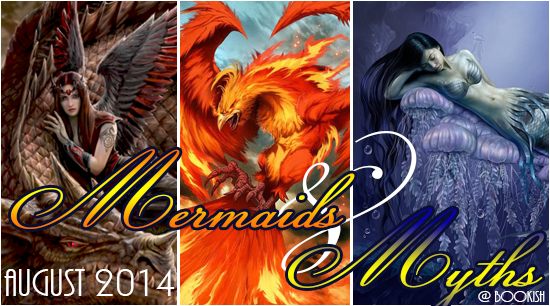 I though it was a convincing and absorbing version of the myth, and I really enjoyed reading it.